See what coke does to a flower in this timelapse of just two days!! These are huge numbers, even if you are thinking correlation does not mean causation. When using the Bradford Hill criteria to evaluate the relationship between diet drinks and human health, it becomes quite clear that the danger is at least worth considering. It’s a great example of how potentially deadly, unhealthy products are marketed to us as a “better alternative” and completely safe. For this study, researchers divided the 60,000 study participants into four consumption groups: two or more diet drinks a day, five to seven diet drinks per week, one to four diet drinks per week, and zero to three diet drinks per month. After a follow up of 9 years, coronary heart disease, congestive heart failure, heart attack, coronary revascularization procedure, ischemic stroke, peripheral arterial disease, and cardiovascular death occurred in 8.5% of the women who consumed two or more diet drinks a day. THOSE WHO CONSUMED FIVE-TO-SEVEN DIET DRINKS PER WEEK WERE AT 6.9% AND ONE-TO-FOUR WERE AT 7.2%. THOSE WHO CONSUMED ONE-TO-FOUR DRINKS PER WEEK WERE AT 6.8% AND ZERO-TO-THREE DRINKS A MONTH WERE AT 7.2%. Then a sugar crash begins, and you may become irritable and sluggish. 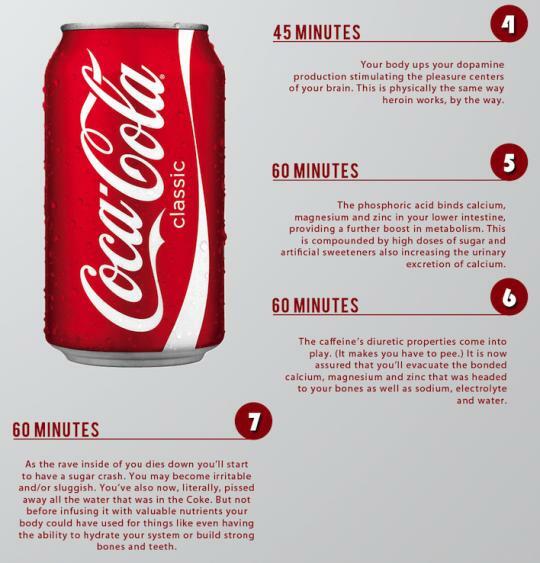 You’ve now urinated out all of the water that was in the Coke, along with the nutrients that the phosphoric acid bonded to in your body that would have hydrated you or gone on to build strong bones and teeth. 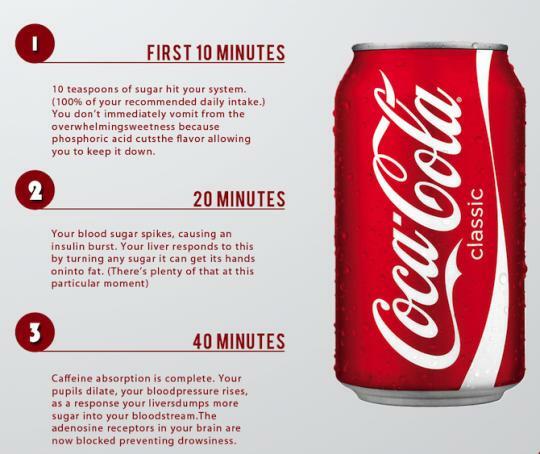 But drinking soda doesn’t just impact your waistline. A 2013 study that was published in the journal Diabetologiafound that study participants who drank one 12-ounce soda a day were at a greater risk of developing Type 2 diabetes.